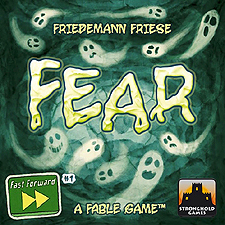 Fear is a fast-paced and straightforward hand management game of tension filled ghost chasing. The Fast Forward series uses the new Fabled Game system introduced in Fabled Fruit. With the presorted deck of cards you will discover all cards and rules as you play. It will take 10-15 games of Fear before your group has explored the entire system. It can then be reset and played again by the same or different groups!